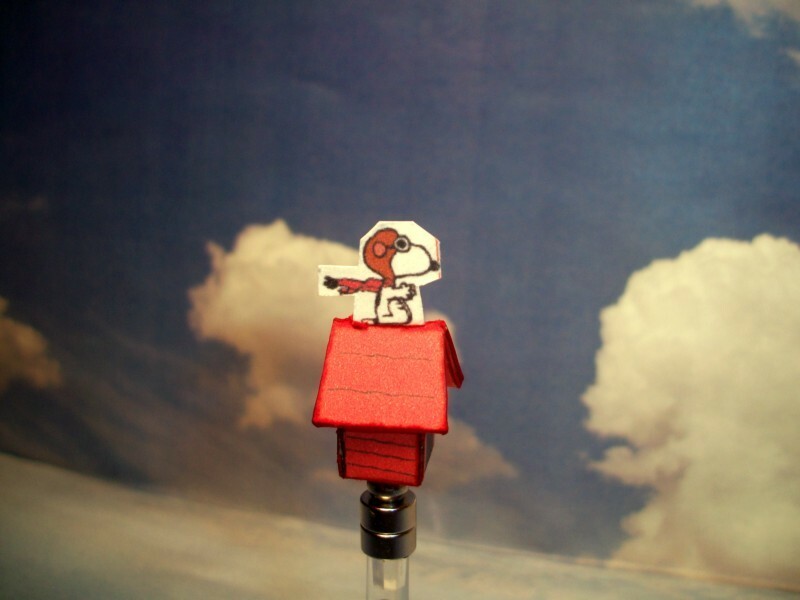 Paper Model of WWI Flying Ace Snoopy and his famous Sopwith Camel Doghouse. I found this on the internet six to seven years ago. The original site no longer exists and I am unsure who the original creator was. To be printed on Card-stock. Cut with a sharp Exacto Knife on the solid outside lines. Carefully score and fold the solid inside lines. Glue with White Glue. I fitted, inserted, and glued in a small cube of styrofoam to the inside bottom of the doghouse. This gives the house more stability and also gives you something solid to "cut" into for mounting a Gimbal Mount Ball-Bearing. Thanks made the full and mini size one. Thanks for the download. Spending this evening making a doghouse! Wow.